A printable cleaning schedule saves you time and effort because it lets you stay ahead of the mess. The fact is, lists keep us on track and help us get more done. When you don’t even have to think about what’s on the list and can just press “print,” it’s much easier to use a cleaning checklist. I’ve created a simple, printable cleaning schedule for daily, weekly, and monthly cleaning to save you the step of creating your own. You probably have your own favorite cleaning products and supplies. For my cleaning routine, I keep products on hand that make cleaning as fast and easy as possible. I thought I’d share my cleaning supply list just in case any of them can help you save time and energy. Broom and dustpan – Essential for cleaning up big spills or broken glass, which in a big family occurs more often than we’d like! Sponges – Although I love the homemade cleaning wipes and microfiber cloths, nothing has the same scrubbing power of a good sponge! Before we get to the printable cleaning schedule, I want to explain how and why I chose the tasks that are included in each category. This way, you can decide whether you want to adopt the cleaning schedule as is or adapt it to your own routine and habits. On the printable cleaning schedule I created, I included the cleaning tasks I (usually) perform each day. The list might appear to be in a random order, but it’s the order in which these tasks occur in my typical day. Make bed – This either happens before I leave my bedroom, otherwise, it doesn’t happen at all. Spray shower with cleaner – As soon as I finish my shower. It only takes a few seconds and makes the weekly clean much easier. Wipe bathroom surfaces – Using the homemade cleaning wipes (described under “Cleaning Supplies” above), I do this after I’ve finished getting ready. Sort mail – I work most of the day and the mail arrives in the afternoon. I try to sort it right away to keep it from becoming clutter in the kitchen or on my desk. Wash dishes – After dinner, my three teens are on kitchen duty. One washes the dishes while another packs up leftovers and clears the table. Clear and wipe table – My third teen wipes the table after someone else has cleared it. Wipe countertops – In our house, this task is lumped in with wiping off the table. Wipe sinks – After all the dishes are done, I do this when I come to inspect the kitchen. Sweep floors – In my ideal world, this happens right after I wipe out the kitchen sink, but it gets skipped as often as it gets done. Declutter – A few minutes of tidying up before I call it a night makes a big difference in how the next day begins. Take out trash – Sometimes this happens earlier in the evening, but if it hasn’t, I like to make sure it goes out before bed so we don’t wake up to garbage odor in the morning. In my house, I also have to do a load of laundry every day since there are so many of us. I didn’t include this task in the printable cleaning schedule though since everyone I know schedules laundry differently. You can write in laundry in one of the blank spaces on the daily cleaning checklist if it’s one of your daily chores. You can also write in any other daily chores I didn’t include. I left several spaces so you could customize the list for yourself. Change sheets – Usually, I just wash the sheets and then remake the bed once they are clean. This prevents me from letting the laundry back up since I have to stay on top of changing the loads to have the bedding done before bedtime. Dust – For our weekly cleaning, we dust all of the furniture and window sills. Vacuum – At a minimum, we vacuum all of the floors and the stairs. If I’m especially energetic (or angry or we have company coming), I also do the baseboards and lampshades. Mop – With 7 people and 3 pets living under one roof, this is a must every week. Clean tub/shower – A quick wipe down with disinfectant is usually all it takes if you use the shower spray regularly. Clean toilet – A good scrub with the toilet wand and a thorough wipe down from top to bottom with a disinfectant. Wash towels – Unlike the bedding, I replace the towels with a clean set and wash, fold and store the dirty set. Wipe up spills in fridge – Ideally, this would happen as soon as spills occur, but I have kids. To keep our fridge from turning into a science experiment, it requires a weekly assessment of the shelves and bins to wipe up small messes. Throw out old food – While I’m wiping up the fridge, I pull out all the old leftovers and any expired food. This usually happens on Saturday so I have a clean, spacious fridge for Sunday’s grocery restock. Wipe down appliances – If you’re really OCD, this might be on your daily list. For me, once a week is enough to wipe away dust and fingerprints. Disinfect kitchen sink – Though I clean the sink each night, I do a deep clean with a disinfectant at least once a week. Clean microwave – Like the fridge, ideally everyone would wipe up messes as they occur, but they don’t. A quick weekly wipe down is enough to keep it from being a biohazard. For my family, the weekly cleaning tasks are usually the ones we knock out as a family on Saturday mornings (chore day). You might prefer to do one or two tasks each day instead. 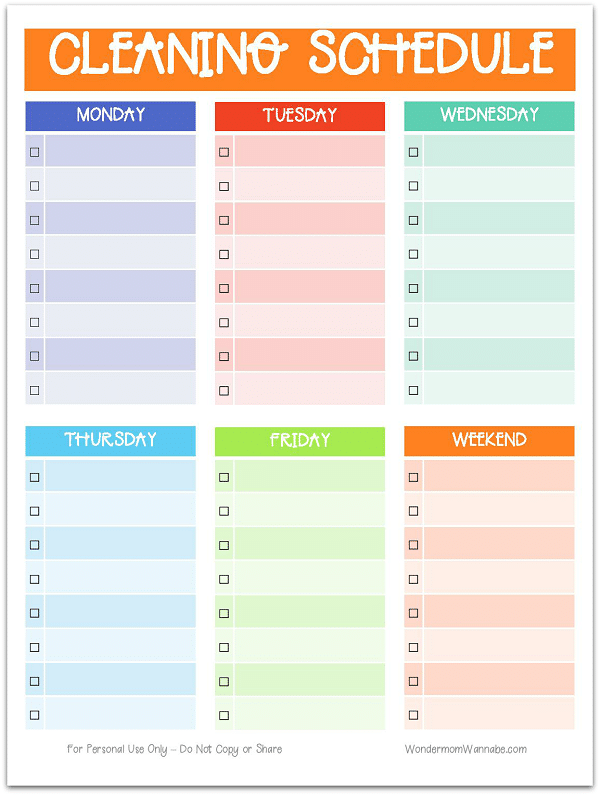 For those of you who like to tackle your weekly tasks throughout the week, I’ve created a blank weekly cleaning schedule you can use to schedule each day. Straighten drawers – Over the course of the month, everything from my t-shirt drawer to the kitchen junk drawer start to get a little out of hand. A few minutes tidying each drawer is all it takes to ward off a major reorganization effort. Vacuum curtains – Window treatments love to collect dust so a monthly vacuuming is necessary. Wash windows – For some reason, my kids LOVE this job so I arm all of them with a spray bottle and microfiber cloth then set them loose. Clean fridge – Even with weekly spot cleaning, the fridge needs a thorough wipe down at least once a month to get all the nooks and crannies. Clean oven – Complete transparency: I don’t do this every month, but I know I’m supposed to. Wipe cabinet doors – Each time I do this, I’m surprised at how dirty they are. I guess because we always notice the counters? It doesn’t take long and it’s absolutely necessary (if my cabinets are any indication). Clean burners – Though my stove gets wiped off each night, spills tend to bake onto the burners. A monthly scrubbing will keep your stove looking like new. Clean wastebaskets – The trash might get taken out every week, but often, little bits are left behind. A good monthly wipe down inside and out will keep bacteria at bay. Clean mirrors – Mirrors don’t get very dirty so once a month should be often enough to keep them sparkling. Clean electronics – We usually get a lot of the dust during our weekly dusting, but once a month a good wipe down with a multisurface cleaner is necessary. Vacuum couch – When my kids were smaller, this actually was a weekly task but now a monthly vacuum of the couch and cushions is sufficient. Clean baseboards – If you ignore your baseboards too long, dust and dirt almost seem to fuse with them. A monthly vacuuming and wipe down is all it takes to keep them looking fresh. Disinfect doorknobs, light switch, remote controls – Actually, we disinfect anything that gets touched or held on a daily basis. This includes video game controllers, stair handrails, and telephones too. 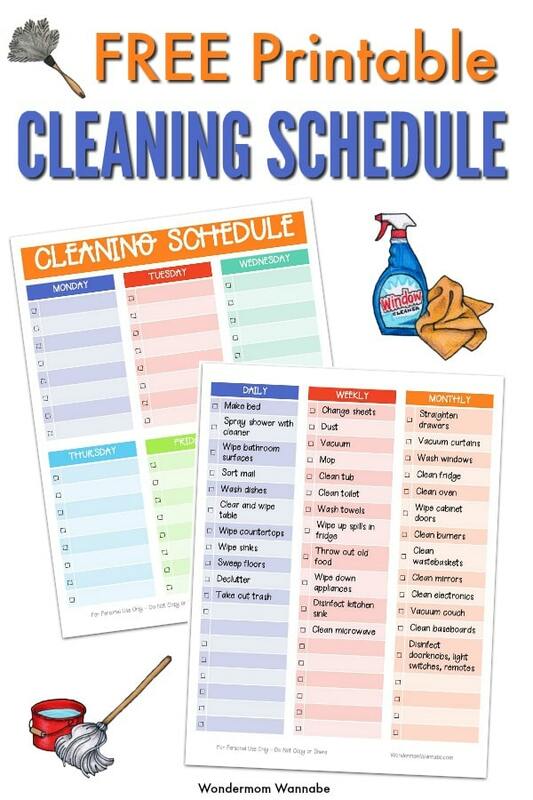 Here is the Printable Cleaning Schedule. Just click the image below to save and/or print the file. 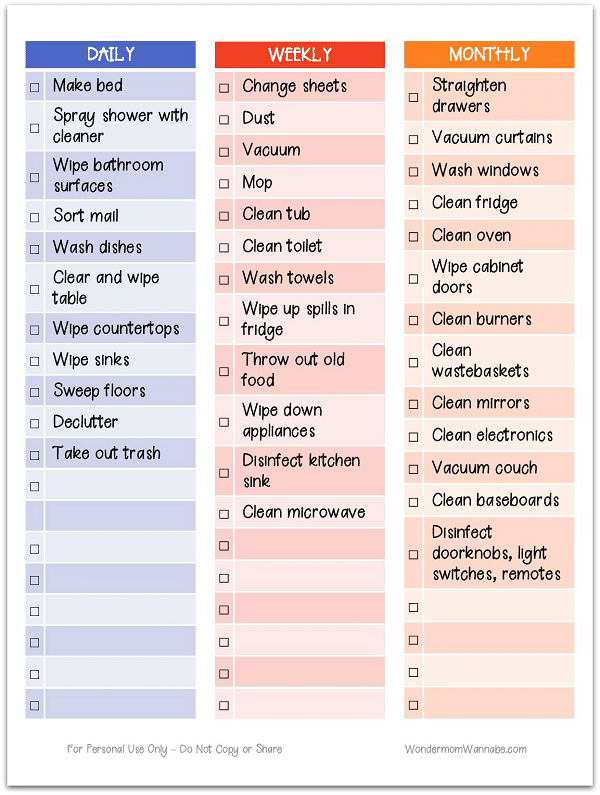 If you liked the printable cleaning checklists above, you’ll love the Home Cleaning Planner. In addition to the two printables above, it contains more cleaning schedule sheets and detailed deep cleaning lists for every room of your house, inside and out!